The official name of the “tar steamer” (the name derives from the fact that the ship had a tarred wooden hull) was steam barge. However, tar steamers have been called by several different names over the years, such as “pikinytky” (pitch jerky) and “kuramylly” (mud mill), which were names used for steel hulled vessels. Tar steamers were barge shaped, wood or metal hulled, round-bottomed vessels with a steam engine and boiler in the stern. The crew cabins and dining room were situated above the engine on main deck level. The pilothouse and bridge deck were situated on the uppermost deck, above the living quarters. The entire prow and central part of the ship was reserved for cargo, as in flat-bottomed boats. 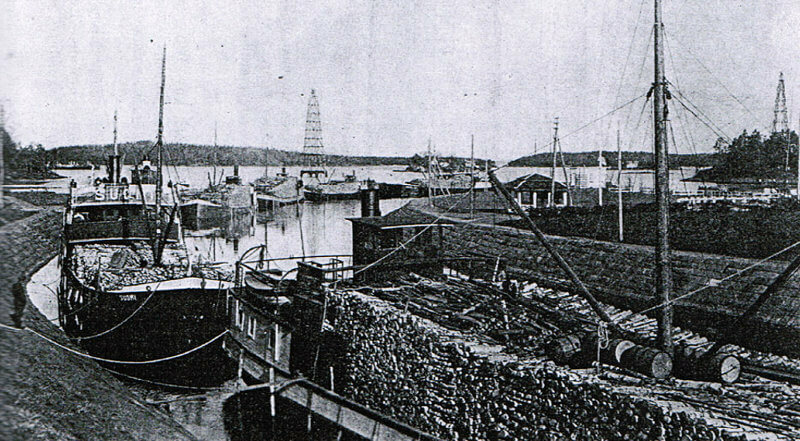 The most common cargo for the tar steamers was logs or other timber that was transported around the Lake Saimaa region and so far as Vyborg and St Petersburg. For example, 8 million stacked cubic metres of logs were carried to the log ports of Suchkoinevo and Kalintkoy between 1914 and 1918. Merchandise such as flour, grain, iron ore and others were brought as return freight. The tonnage of a full-sized vessel was 150–190 GRT. About 650 stacked cubic metres of logs could be taken aboard which the tar steamer, floating in deep waters, transported to its destination at a speed of 4.5–7 knots. The loading of the cargo before sailing took 2–3 days. The overall dimensions of a full-sized tar steamer were determined by the dimensions of the locks of the Saimaa Canal which at that time were 31 x 7 x 2.4 m. Tar steamers smaller than these dimensions were called undersized. Engines: 100 indicated horsepower, C2 cyl. The ship was constructed at the Lehtoniemi shipyard in Joroinen in 1902. The SS Suomi was commissioned by Pohjois-Karjalan Höyrylaivaosakeyhtiö, the registered office of which was situated in Joensuu. 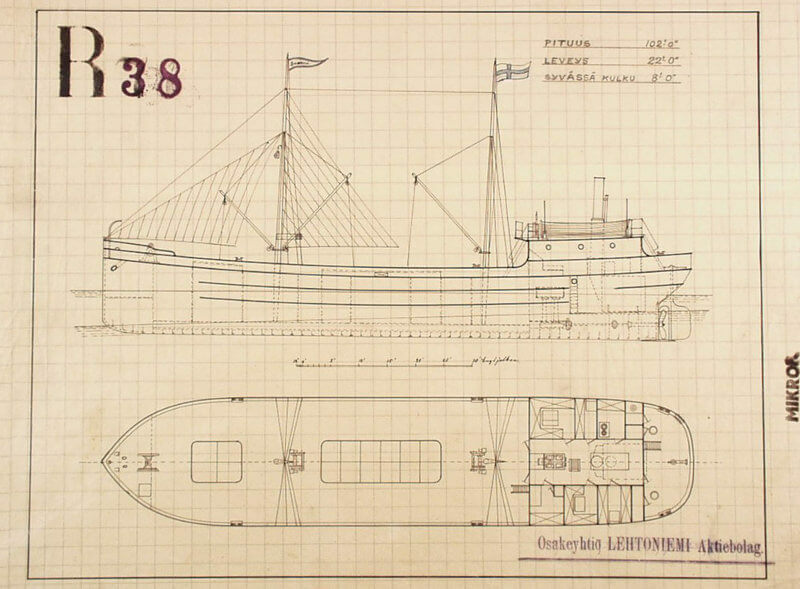 Therefore, the ship was completed in Joensuu where the ship was registered on 2 June 1902. The ship changed ownership on 5 March 1904 when T:mi Gustav Cederberg & Co bought SS Suomi and SS Arvo for 50,000 Finnish marks. On 7 March 1908, T:mi Gustav Cederberg & Co changed to a limited company, which meant that the ship “changed ownership”, again with the SS Arvo. Following the outbreak of World War I in 1914, the Russian Imperial Navy took the SS Suomi into its possession, apparently for military purposes. Unfortunately, no exact information has been discovered about the use of the SS Suomi under the authority of the Russian Imperial Navy. However, the next available information on the history of the SS Suomi dates from the year 1918 when the civil war was raging and the Reds sank the ship in the River Aurajoki on 11 April. The SS Suomi was blown up with several other ships at the dock of Otkantti in the location of the present Turku Passenger Terminal. 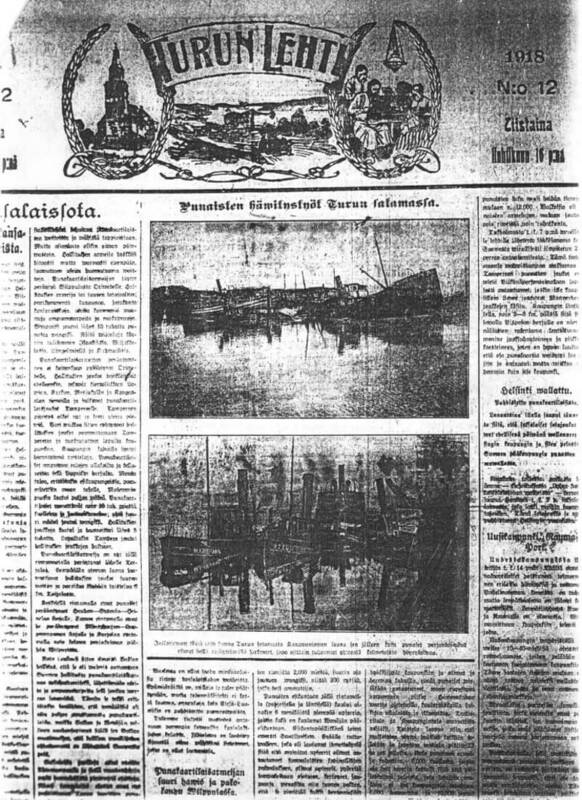 Turun Lehti newspaper reported on the incident on 16 April 1918 as follows: “On Thursday evening just before 11 o’clock we woke up to a sharp and violent bang which was followed by several similar. The reds had at that time reached the Kanavaniemi port on their destroying and plundering expedition to carry on with their favourite desires. The aforementioned violent bang was caused by the Reds who had set the torpedo and mine warehouse occupied by the Russian navy on fire. Most of them have probably been unloaded. After having done this, the red band of robbers moved on to destroy steamships tied to the adjacent dock, which had been mobilised at the disposal of the Russian war fleet but have now been returned to their owners. It was generally thought that the good old coastal boats would again run their own routes during the approaching summer but these “guardians of the people’s happiness and success” had decided otherwise. All 14 ships tied to the dock were wrecked completely, partly by burning, partly by blowing up. The wrecked ships included Sven Dufva, Bargas, Uttu I, Uttu II, Salo, Wellamo, Marienhamn, Wihuri, Wasama, Rya Kraiten, Vili, Soisalo, Suomi and Riminto. The most badly wrecked are Sven Dufva and Salo. – The sight in Kanavaniemi is the saddest. The bows of the ships are standing upright, hulls are burnt, ship parts everywhere. And revolting fumes of gas of the mine warehouse are emitting smoke nearby. An excellent example of a truly true democracy”. Later during the same year the ship was lifted and repaired by A/B Vulcan engineering workshop from Turku. The ship was put up for auction on 24 May 1919. The same year, on 28 November, Laiva Osakeyhtiö Arvo / Viktor Emil Mäkelä shipping company was entered as the owner. The ship was registered under the same owner’s name in Helsinki on 8 March 1920. The purchase price was 337,500 Finnish marks. In 1922, the owner changed to Savonlinnan puutavara Osakeyhtiö / Nestori Kojonen timber company. The same year, the company changed its name to Kojonen & K:nit Oy and again to Sulka Oy in 1936. The SS Suomi was registered both in Vyborg and Savonlinna in the ownership of Kojonen. In 1944, when the state of war was abating, the ship’s nominal owner changed again. The new owner was a big company in the woodworking industry of the time, Repola & Viipuri Oy, behind which lay companies of businessman Nestori Kojonen. The place of registration changed to Savonlinna. The first name change in the history of the entire ship took place in 1946 when the entire fleet of Repola & Viipuri was renamed. All tar steamers received the name Pikisaari, tugboats the name Repola and barges the name Pääskyniemi. A number was also attached after the names to distinguish the ships from each other. 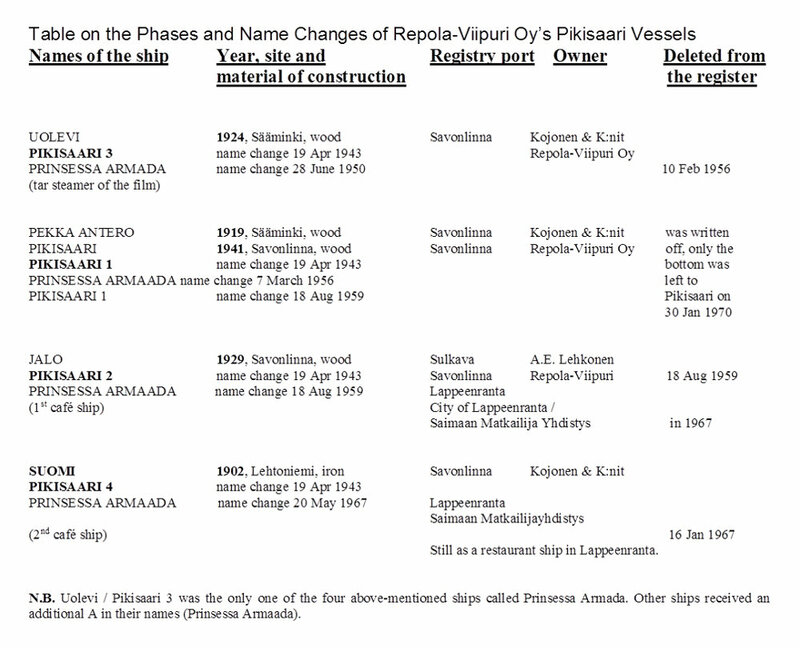 This is how also the SS Suomi acquired the name Pikisaari 4. Repola Oy’s fleet also included Pikisaari 3, the former name of which was Uolevi. The ship in question later found fame in Suomi Filmi’s film ‘Kaunis Veera eli Balladi Saimaalta’ (Fair Veera, or a ballad from Lake Saimaa) directed by Ville Salminen. Uolevi’s name was changed to Prinsessa Armada on 28 June 1950 when the shooting of the film started. The name change was made only for the film. The vessel was finally deleted from the register and written off in 1956. In this connection, Pikisaari 1 was named Prinsessa Armaada for a few years. In 1959, the then-current Prinsessa Armaada’s (Pikisaari 1) name was changed back to Pikisaari 1 and Pikisaari 2 (originally named Jalo) took its place and was respectively christened Prinsessa Armaada. The ship was then bought by the city of Lappeenranta / Saimaan Matkailijayhdistys ry tourist association. 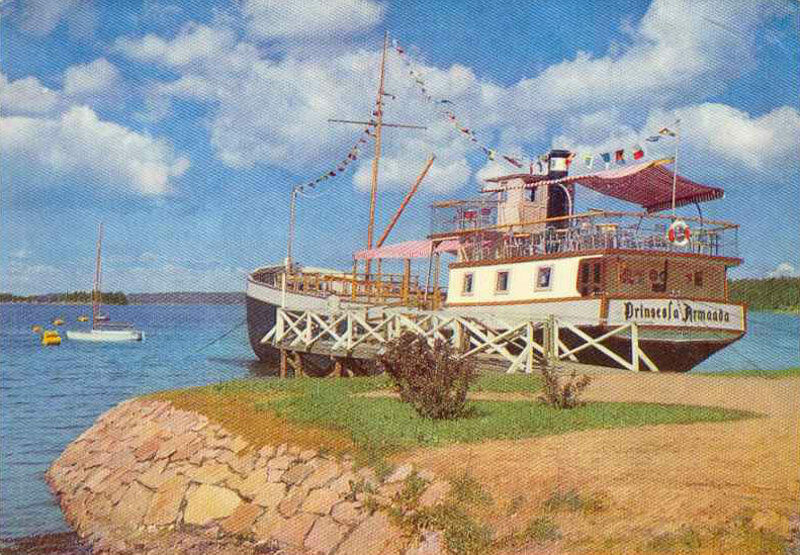 The Prinsessa Armaada (Jalo / Pikisaari 2) was transferred to Lappeenranta as a café ship. The café ship was written off in 1967. At about the same time, Saimaan Matkailijayhdistys ry bought Pikisaari 4 (originally named Suomi) from Rauma Repola (formerly Repola-Viipuri Oy) to replace the former Pikisaari 2. 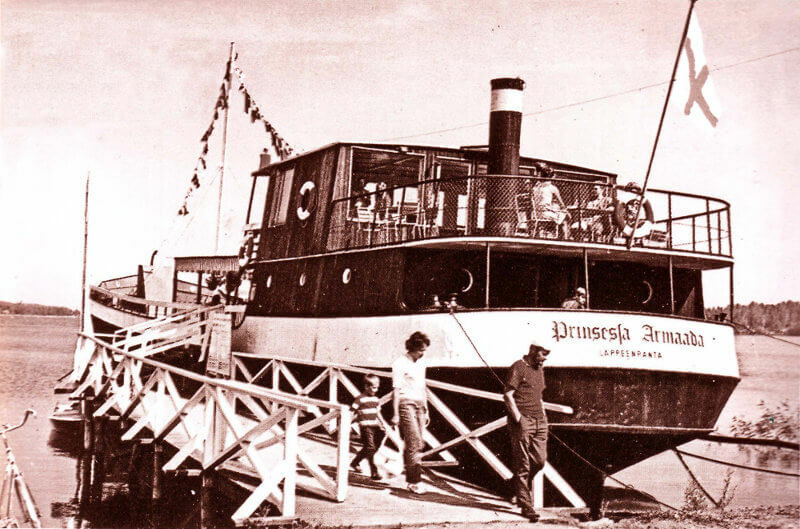 This is how the name of the original Suomi steamer was changed from Pikisaari 4 to Prinsessa Armaada. 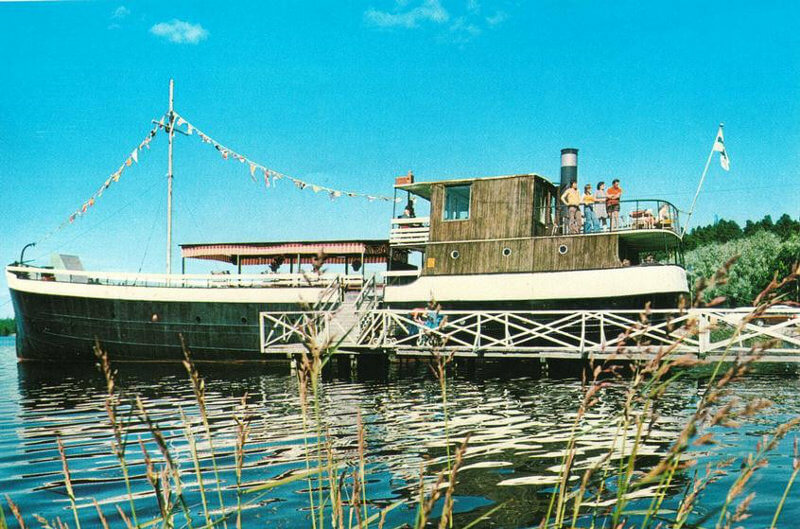 The Pikisaari 4 was christened Prinsessa Armaada by Gunnel Käkelä, the wife of Minister Valto Käkelä, on 20 May 1967. 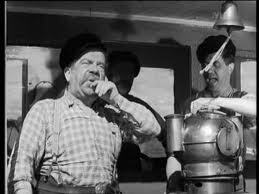 The vessel was located in the place of the first ship café (Jalo / Pikisaari 2) in Lappeenranta’s Halkosaari. In 1977, the ownership of the vessel changed again when Lomaliitto ry holiday association bought the vessel. The ship still remained a ship café in Lappeenranta’s Halkosaari. 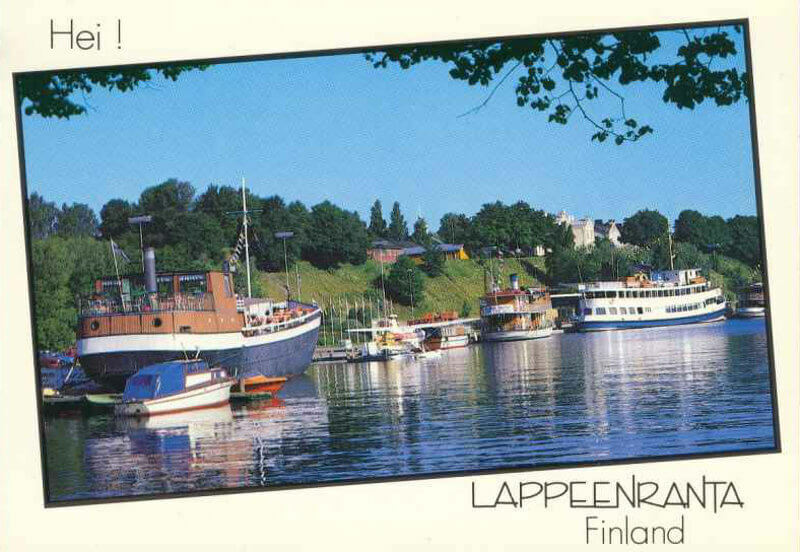 In 1979, the café ship was transferred from Lappeenranta’s Halkosaari to the side of Satamatori marketplace. Suomi / Pikisaari 4 / Prinsessa Armaada changed owners for the last time in 1980 when Kari Nalli Oy bought her from Lomaliitto ry. 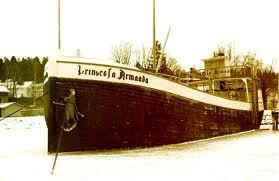 The restaurant ship Prinsessa Armaada is still operating as a restaurant ship in the port of Lappeenranta. 100-year-old festivities were celebrated in a sunny weather in the summer of 2002.